Music inspired by visual and literary arts will be performed by the Eastman Wind Ensemble on Friday, Feb. 3. Dancers from the University of Rochester are collaborating with the ensemble to present a multi-sensory experience exploring themes of creation and degeneration. 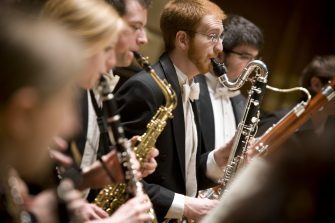 With a program ranging from chamber to symphonic works, the concert underscores the talent, flexibility, and virtuosity of the Eastman Wind Ensemble to perform a wide spectrum of original works. The concert, at 8 p.m. in Kodak Hall at Eastman Theatre, opens with Darius Milhaud’s La creation du monde, written in 1923 as a ballet score for Les Ballets Suedois in Paris and based on an African creation myth. The 18-minute work will be performed by 18 musicians, who will be joined by four students from the University’s Program of Dance and Movement, directed by Missy Pfohl Smith, and eight members of Smith’s professional ensemble, BIODANCE. Milhaud was one of the earliest composers to combine jazz and classical elements in his music, and La creation du monde incorporates the jazz sounds, harmonies, and rhythms he heard when visiting Harlem. While the music has taken its place in concert repertoire, performance of the work has only occasionally included ballet in the ensuing 90 years. Professor and Chair of Conducting and Ensembles Mark Scatterday and Eric Laprade, a Doctor of Musical Arts student and conductor for the Feb. 3 performance, approached Smith last spring and asked her to reimagine the ballet in a modern context. For this performance, Smith fused vernacular jazz dance elements from the 20s and 30s with a more classical modern dance style. She approached the work conceptually, “not to tell a literal narrative of Creation, but to generate movement and structure that uses organic images of simple cells and cell division, of natural and evolving landscapes, and nod to the Big Bang theory,” she explained, while thinking about the birth of jazz music in America and how it evolved alongside jazz dance. “This concert creates an opportunity for musicians to interact with other artists, and creates connections between the University’s River Campus and the Eastman School of Music,” said Laprade. La creation du monde will be presented again at 2 p.m. on Wednesday, Feb. 8, in Room 415 of the Eastman East Wing, incorporating projected images by digital media artist W. Michelle Harris. For the third work on the program, Circus Maximus by John Corigliano, audience members will be surrounded by musicians, who will be performing on the stage and in the hall. Written in 2004, Circus Maximus is approximately 35 minutes and requires 76 musicians who will play the work’s eight sections without pause. The work draws on parallels between the high decadence of ancient Rome, where citizens were entertained by chariot races, hunts, and battles in the arena, and present times, where entertainment dominates reality and “reality shows” flood television screens.